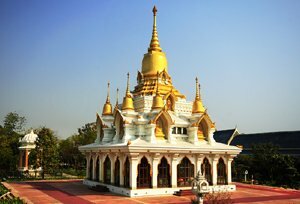 A Religious pilgrimage center in Kushinagar District in the beautiful state of Uttar Pradesh, Kushinagar is a place where Lord Buddha attained Nirvana. It is famous for numerous monasteries and stupas dating back years ago are almost in relics now. Many devotees flock to this place every year from all over the globe to explore what city has to offer to its guests. One can also pay a visit to many temples during the tour to Kushinagar for wholesome experiences. The much explored site of this beautiful town is Mahaparinirvana Stupa which is positioned above the location where Gautam Buddha is finally resting. So Plan your trip to this beautiful place and relish your delightful retreat. The Kushinagar's history dates back to centuries back and in those times it was dubbed as Kushavati (Jatakas). It has its mention in Ramayana and it is said that the town got its name from the son of Lord Rama, Kusha. Besides this, it was a famed place of the Malla Empire of ancient India. According to legends, Gautam Buddha fell ill after having some mushrooms served by a local. And once he recovered from his illness, he attained final nirvana at this spot. Many of the Stupas here were constructed centuries back and is said that Ashoka, the Mauryan Kingdom had contributed to important erection at this place. Legend goes that it was a significant site for Jain, Vaishnavism and Shaivism values. 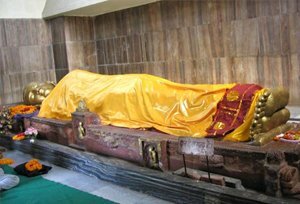 Indo - Japan Srilanka Temple: Having a famed eight metal statue of Gautam Buddha which was transported from Japan, Indo - japan Srilanka Temple is a highly visited attraction in a beautiful town of Kushinagar. The architectural brilliance was erected by the Atago Isshin World Buddhist Cultural Association. Chinese Temple: Also Dubbed as Lin sun Temple, Chinese Temple is different from the other shrines placed in Kushinagar. It is a blend of Vietnamese and Chinese structural design. Not only this, the temple has a majestic statue of Lord Buddha which allures the tourists from all across the globe. Wat Thai Temple: One of the main sacred places of Buddhist followers, Wat Thai Temple attracts the travelers with its fabulous architectural beauty. It is enclosed by different varieties of trees and vegetation. Matha Kuar Shrine: Matha Kuar Shrine houses a statue of Buddha which is believed to have been constructed of a single stone. One must pay a visit to this temple while on a trip to Kushinagar. Meditation Park: A small park situated in proximity to the Mahaparinirvana shrine in Kushinagar, Meditation Park boasts of water bodies with bright green exquisiteness making it a perfect destination for meditation. Travelers visit this park to unwind in a peaceful and serene ambience. By Air: The closest airport would be Varanasi having regular flights to all main cities of India encompassing Agra, Mumbai, Bangalore, Delhi and many other places. By Train : The nearest railhead is located in Gorakhpur at a distance of 30 miles from the revered town of Kushinagar. By Road:	It is well connected with all the main destinations of India by excellent motorable roads. One can also get here by availing the public and private bus services offered in many cities around kushinagar.